The Pixel Mill is open! The Pixel Mill, a creative co-working space in Ormeau Baths Innovation Centre designed to hot house local game development teams, was officially opened on Friday 23rd November. Seven start-ups are already in place taking advantage of free working space, a business support programme which is second to none and access to finance to develop their ideas and games content. The Pixel Mill is funded by Northern Ireland Screen with support from the Department for the Economy. Situated in Belfast City centre, facilities on site include a state of the art user testing lounge powered by Dolby, access to 100mb per second broadband, modern co-working space, breakout and creative spaces for informal working and meeting, boardroom and event space. The seven occupant companies are; Blackstaff Games, Brain and Nerd, Capstone Games, Cupboard Games, Northern Softworks, Rocket Flair Studios and Whitepot Studios. Over the coming months it is hoped that more developers will take up residence in what is undoubtedly one of best supported games incubators in the UK and Ireland. Ormeau Baths is also home to Digital Catapult NI’s Immersive Lab which will give residents of The Pixel Mill the opportunity to get hands-on experience with the latest immersive technology including Augmented Reality, Virtual Reality and Mixed Reality enabling them to demonstrate, innovate and test their own business ideas and research. The Pixel Mill is Northern Ireland Screen’s key commitment to the Future Screens NI programme, a creative industries R&D partnership between Ulster University, Queen’s University Belfast and local industry, which aims to advance and grow the creative industries sector in Northern Ireland. 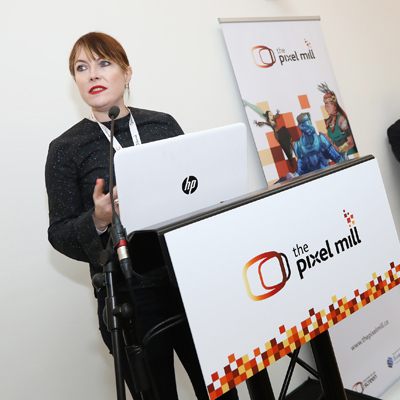 The Pixel Mill will also serve a larger role as a gaming community meeting place, a window to the Northern Ireland gaming ecosystem, and a platform for gaming initiatives here.